A pair of oil pipeline blasts engulfed a Chinese port in flames for 15 hours before firefighters were able to extinguish the blaze, state-run media reported. The fire was far from residential areas and no casualties were reported, government spokesman in the northeastern coastal city of Dalian told the Xinhua news agency. More than 2,000 firefighters and 338 fire engines from 14 cities across Liaoning province worked through the night to put out the fire, Xinhua said. 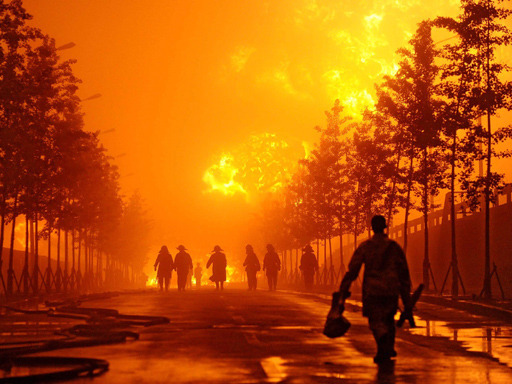 Firefighters walk near flames towering from a pipeline explosion at a Chinese port in Dalian, in northern China’s Liaoning province on Saturday, July 17, 2010. The oil pipeline at the busy Chinese port exploded, causing a massive fire that burned for 15 hours before being put out. Officials said no one was killed. State-run media said the pipeline blew up Friday evening, and more than 2,000 firefighters worked overnight to control flames and further blasts on a second pipeline. China Central Television showed the fire raging among tanks at the port in the northern city of Dalian, and state media described flames of about 100 feet high. The pipelines are owned by China National Petroleum Corp., which is Asia’s biggest oil and gas producer by volume. The cause of the initial blast was not clear. The Xinhua News Agency said it happened while a Liberian tanker was unloading oil at the port. It said the tanker left safely. Xu said the flames gave off gas containing sulfur and aromatic hydrocarbon that were not fatally toxic, Xinhua reported. Dalian’s secretary general Xu Guochen told a news conference Saturday morning that firefighters had turned off valves on all oil tanks at the site. A view of the sea polluted by leaked oil after a pipeline explosion at the Chinese port of Dalian Saturday. A vast stretch of polluted sea remains the next challenge. About 20 boats were trying to clean up a dark brown slick of oil and pollution at least 19 square miles in size off Dalian’s Xingang Harbor.